Stu (Colin Farrell) is a publicist *Slash* agent. He is smooth, decisive, obnoxious and confident in equal measure, with liberal doses of oiliness to keep everything moving. He never stops moving and never stops talking. His mobile phone is always in contact with one hand and one ear, while his lips blabber away below fobbing, fluffing and falsifying. The only time Stu stops moving is conveniently the only time he doesn’t use the mobile phone. At the same day and time Stu pops makes excuses and pops into the same phone booth to call the same person that he wouldn’t want the wife to know about. On this day though as soon as Stu finishes his call out, a call comes in to the phone booth. And for some reason Stu – who has no time for anyone but himself – pauses to take time to pick the phone up. Stu will regret this. A Distinctive Voice * on the other end tells Stu that he is watching on from an unknown vantage point. Watching on through a scope. Over the next hour Distinctive Voice plays Stu like a puppet, stripping him of his poise and cool and putting him firmly in the spotlight for less than ideal reasons. * Keifer Sutherland. The Distinctive Voice is Keifer Sutherland. It is no spoiler if everyone twigs to who it is within 4 seconds flat. The cops show up fronted by Captain Ramey (Forest Whitaker). They wonder why the guy in phone booth seems so very reluctant to come out for a chat, and every time Stu thinks about telling them the truth, Distinctive Voice warns him against it and make him do something silly and dangerous. With a limited premise and in a limited area, the film must build tension quickly and often at the expense of realism. Instead we the audience must wonder the usual things; how will he get out of this? Who (besides Keifer Sutherland) is responsible and why? Are the cops really this inept? …and why in a film with so many mysteries would they choose the guy with one of the most distinctive voices in Hollywood to play the Mystery Man? Why doesn’t Stu yell out ‘Look around for Keifer Sutherland!’? Despite this bonehead decision the film is compelling for a while. It’s amusing to see Stu squirm. Interesting to see Distinctive Voice’s Se7en-lite plot unravel, and while the ending is patently ridiculous (Seriously cops! You’re that useless?) 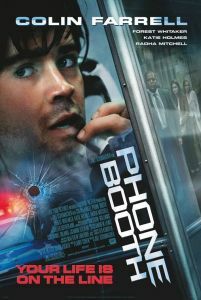 Phone Booth is a rewarding 80 minute thriller with enough decent moments to justify that you accept the charges and take the call. Final Rating – 7 / 10. Hilarious that people under 20 won’t even know what a phone booth is.